Christmas break is coming, and my kids are going to want to make crafts everyday. 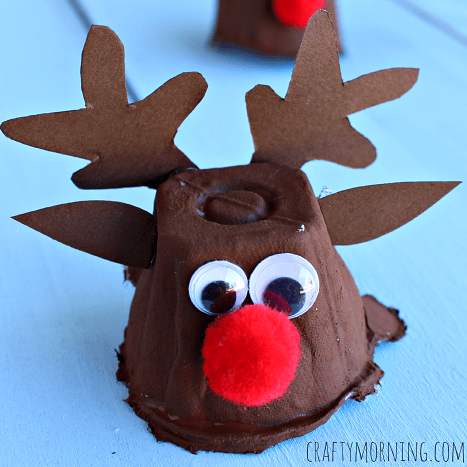 I’ve got several of these 20 adorable reindeer crafts for kids planned for our time off. 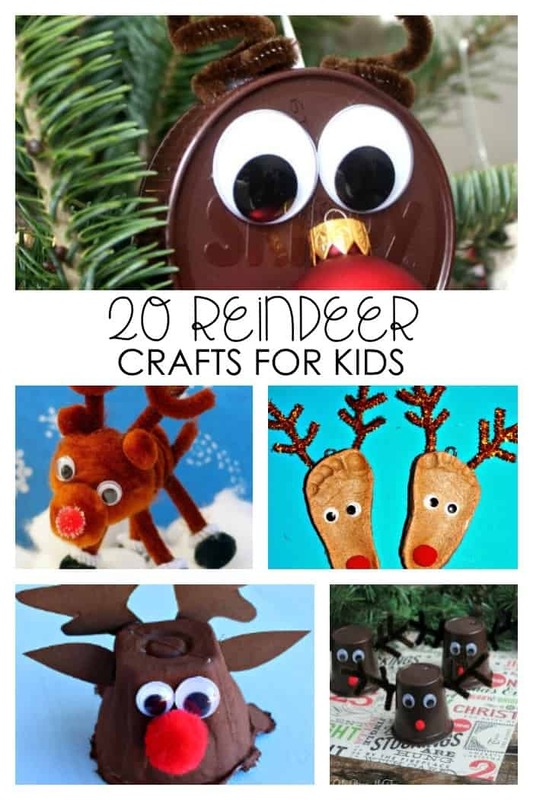 Check out all these great reindeer crafts, perfect for keeping your children busy this Christmas break. Quick and easy Country Candy Cane Reindeer from She Saved with their gingham ribbons and button noses are adorable hanging on the Christmas tree after your kids make them. If your family drinks a lot of k-cups, then this Reindeer K-Cup craft by You Brew My Tea is a great way to upcycle those empty k-cups and end up with a cute craft too! Upcycling household items for craft purposes is always a hit for both Moms and kids. 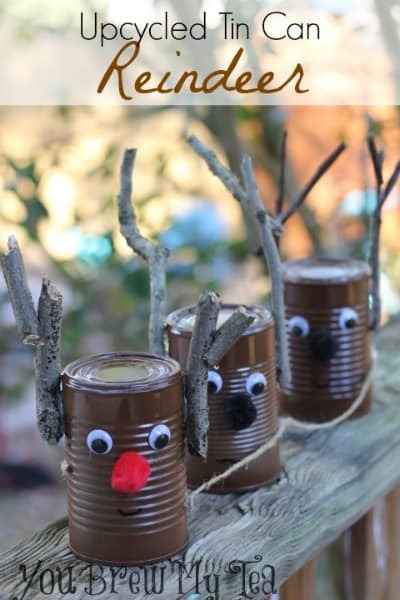 These Upcycled Tin Can Reindeer also by You Brew My Tea is just the cutest thing ever! Do you have old wine corks sitting around? Many of us moms have many extra around this time of year, right!? Grab some sticks and a few wine corks and create these precious Wine Cork Reindeer from Taking Time for Mommy. 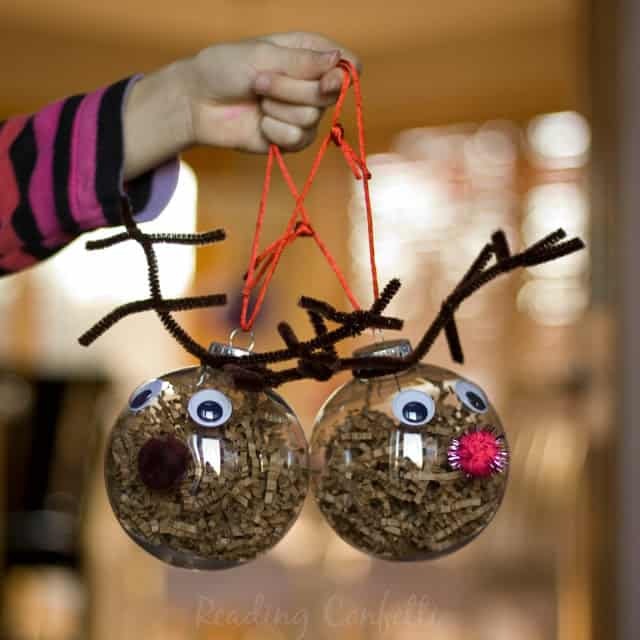 These pipe cleaner and pom pom reindeer from The Purple Pumpkin Blog could not be any cuter! My preschoolers love making music, and they love creating their own musical instruments even more. These Rudolph Rain Sticks by Mama Plus One, are perfect for music loving preschoolers, plus you probably have everything you need to make them at homes already. Adorable Reindeer Noses by Stockpiling Moms, are the perfect treat for your child’s classroom at Christmas time, and they have a free printable to make your life easier! Every mom wants an ornament made from her child’s footprint to hang on the tree, right!? Look no farther than these precious Reindeer Footprint Ornaments by Messy Little Monster. While we are talking reindeer ornaments, don’t miss these Easy Reindeer Ornamentsby Little Bins for Little Hands. This craft is upcycling at its finest! Everyone loves snack time! Make these easy and adorable Rudolph Reindeer Pudding Cups by Passion for Savings, for your next holiday playdate. This adorable Reindeer Ornament from Reading Confetti, is one of the first on my list for our holiday crafting. Easy and hopefully mess free- yes please! 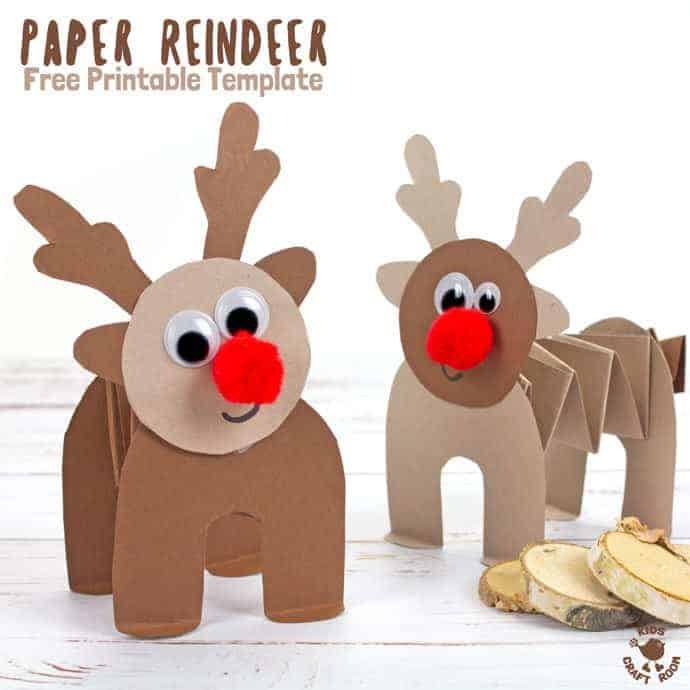 The Kids Craft Room’s Accordion Paper Reindeer craft is fun and easy to make. Plus, it comes with a free printable, so you don’t even have to try to draw your own pattern! 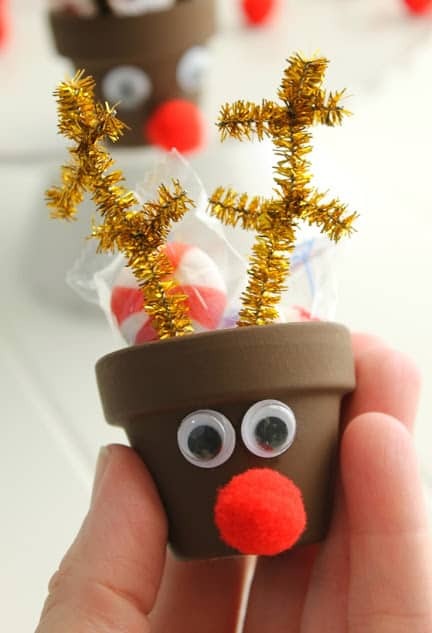 These easy Rudolph Clay Pots are perfect for gifting small treats this Christmas. If you have extra toilet paper rolls, then this Paper Roll Rudolph by Arty Crafty Kids, is a great choice. The twig antlers are adorable! Crafty Morning shares a great Egg Carton Rudolph that is not only fun to make, but also fun to play with after the craft dries. You can also make a quick and easy jingling Rudulph using construction paper, jingle bells, a few craft supplies, and your child’s hand print with this Reindeer Handprint from The Best Ideas for Kids. 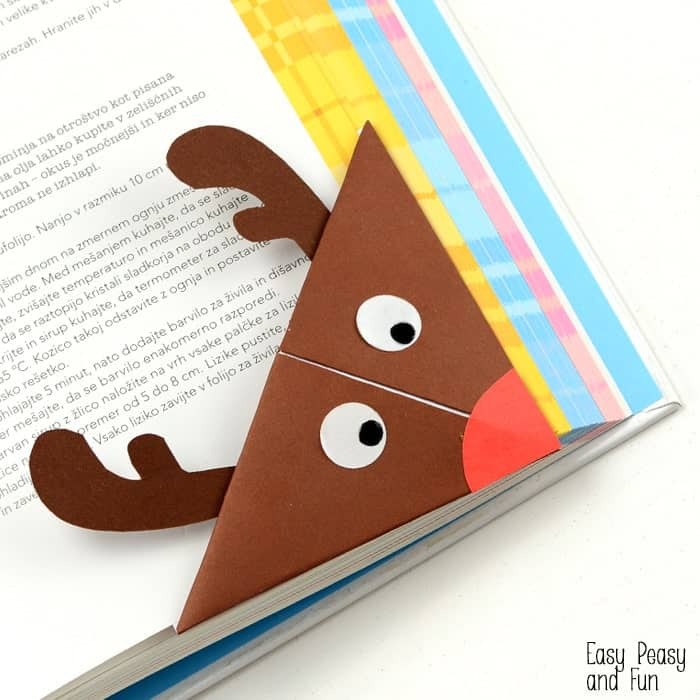 Even bigger kids will love this adorable Reindeer Origami Corner Bookmark from Easy Peasy and Fun, plus it will encourage a little Christmas break reading too! Popcicle or craft sticks are always fun to craft with. You can make this adorable triangle Reindeer Christmas Ornament from the Kindergarten Connection, and this Popsicle Stick Reindeer Christmas Ornament from Free Kids Crafts. Make a bunch of each and use them as gift tags for Christmas presents this year! 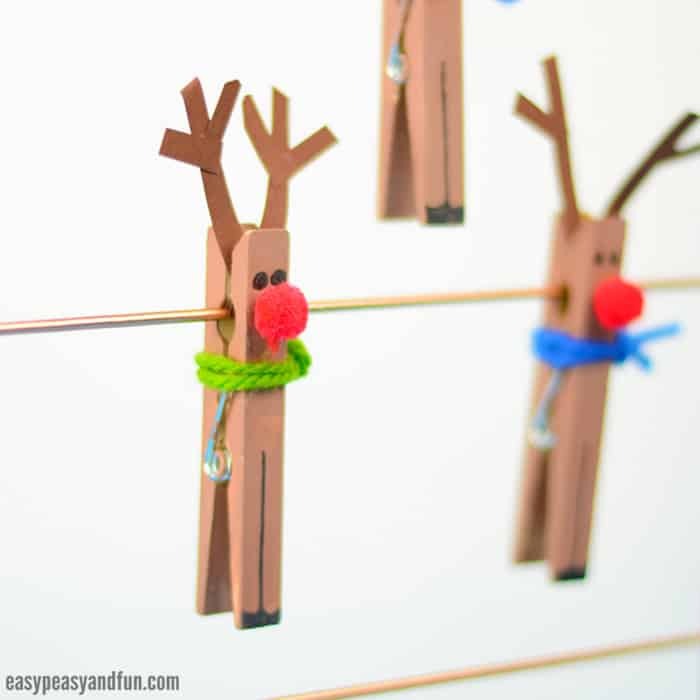 These easy Clothespin Reindeer from Easy Peasy and Fun would be so cute to use to hang your Christmas cards this year! 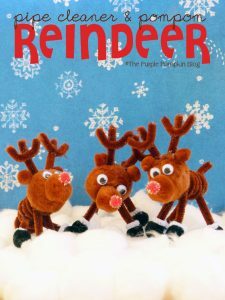 Pick several of these fun Reindeer Crafts to keep your kids happy and busy during Christmas break. Even better, use them as gifts for friends and relatives!